The film Mohenjo Daro opens in the remote village of Amri, where Sarman (Hrithik Roshan) and his friends wrestle a large crocodile in a riverine gorge. Amri is shown as a remote farming village from where the villagers travel to Mohenjodaro as it offers a bigger market for their wares. 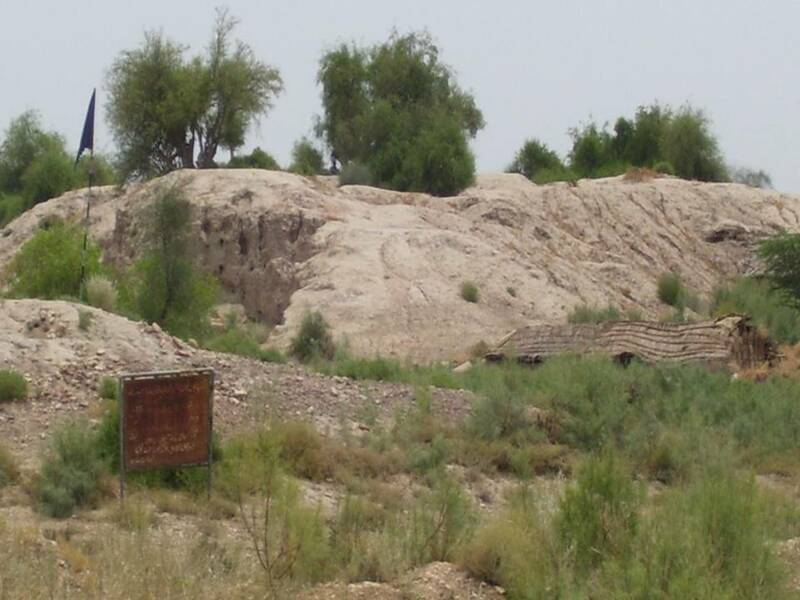 In this post we shine a light on the archaeological evidence from the ancient site of Amri, which lies on the western bank of the Indus, about 160 km south of Mohenjodaro. The archaeological importance of Amri was demonstrated in 1929 by the excavations of N.G.Majumdar, who discovered there, for the first time, a settlement of pre-Harappan date and culture that was underlying a Harappan one. These excavations however, were on a small scale and the account that was published was of a summary character. It was the work of Jean-Marie Casal and his colleagues over three seasons between 1959 and 1962 that established the nature of this pre-Harappan culture and how it was replaced. Casal's excavation revealed four successive periods of occupation. The first of these is the 'Amrian', which relates to other pre-Harappan sites in the region as well. Amri is the type-site of this early cultural assemblage. In this phase, houses were of mud-brick. Pottery, copper and bronze fragments were also recovered. Phase II shows an increasing component of Harappan materials alongside the Amrian. Period III belongs to the Harappan, giving evidence of early, transitional, and late sub-phases, into a final 'Jhukar' sub-phase. The final phase, Period IV, is not well represented, but it produced the coarse grey ware comparable to the sites of the 'Jhangar' complex. The early occupation at Amri has been dated between 3600 and 3300 BCE and thus represents a slightly later phase than Balakot. 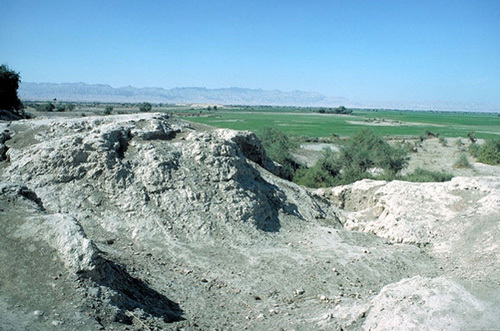 Amri is located close to the west bank of the Indus river but also only some 10 kilometres from the easternmost extension of the Baluchistan uplands. It is in the Dadu district of Sindh, and lies to the south of Mohenjo Daro. The site comprises two main archaeological mounds, A in the east and B in the west. Amri Phase pottery is a red-buff ware, mainly hand-made, and includes such vessel forms as angular-walled and hemispherical bowls, dish-on-stand (rare), and most commonly S-shaped jars. Black, brown and red paint were applied to the vessel’s surface or to a cream or buff slip or wash in monochrome or bichrome schemes. Decorative schemes emphasized geometric motifs in horizontal bands with frequent use of ‘checkerboard’ and ‘sigma’ motifs (Fig.8). In the later Amri phase ID, motifs become more complicated and involve the use of intersecting circles, ‘fish-scale’ motifs, zoomorphic motifs and the rare use of red slip. Other terracotta objects include beads, bangles, humped cattle figurines, and circular, square and triangular cakes. Stone tools are similar to other phases except that there was an emphasis on geometric microliths. Only the following additional type objects have been identified: carnelian beads (rare), shell bangles, bone points and bangles, a steatite rod and a copper blade. Certainly ceramic craft specialists were present, but it is difficult now to establish certainly other types of full- or part-time specialists. In Amri IB, several small, contiguous, rectangular mud-brick houses divided into small rooms were found. Two types of structures were identified in Amri phases IC-D. One type was a large, rectangular mud-brick house with lateral doorways. The other was large rectangular mud-brick structures divided into small units similar to those found in the KGM Phase at Mehrgarh, which may have had a storage function. Stone was also used in construction but probably as a foundation for mud-brick. Public architectural units (enclosing walls) have been noted only at unexcavated sites. Hunting and fishing may have been more important in the Amri Phase, though the economy was still based on domesticated plants and animals (especially humped cattle). Some Amri Phase sites seem associated with large shell middens, and at Amri Casal found large quantities of gazelle as well as other wild animals. Fairservis has also noticed a slightly more varied settlement pattern involving two settlement types – dispersed (single or small clusters of houses) and nucleated (larger settlements with multiple structures and units of public architecture). This more varied settlement pattern may reflect the larger economic role of hunting and fishing. This part of the Indus valley region is poor in mineral and semi-precious stone deposits. The presence of semi-precious stones and metal artefacts in the Amri Phase therefore indicates some interaction with other social groups in the Indus Valley and/or Baluchistan Traditions. Some degree of interaction is also suggested by Amri Phase style pottery in the Balakot Phase and Kot Diji Phase pottery located at Amri. Moreover, the presence of similar script characters on the pottery of all these phases suggests that the communication networks linking these phases involved more than just the simple movement of commodities. Casal, J. M. (1964). Fouilles d'Amri. Paris: C. Klincksieck. Coningham, R., & Young, R. (2015). 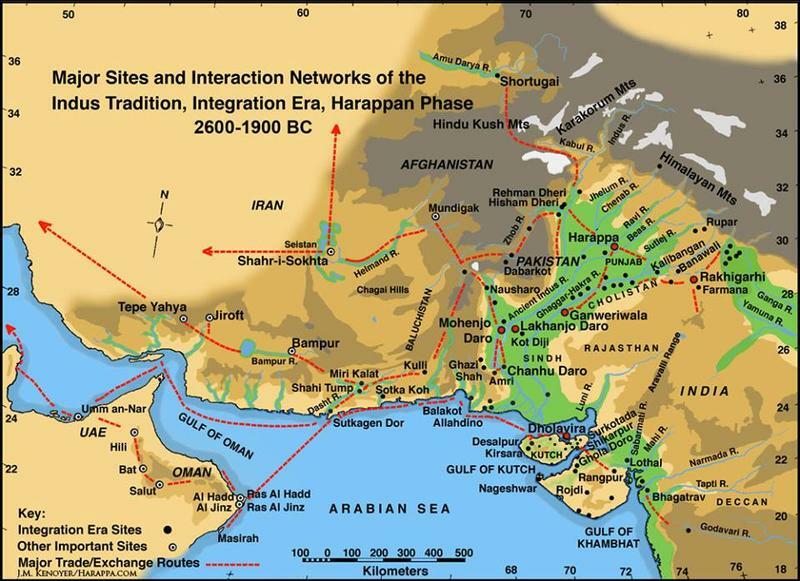 The Archaeology of South Asia: From the Indus to Asoka, c. 6500 BCE-200 CE. New York: Cambridge University Press. Shaffer, J.G., & Thapar, B.K. (1992) "Pre-Indus and Early Indus Cultures of Pakistan and India." In A.H. Dani, V.M.Masson, J. Harmatta, B.N.Puri, G.F.Etemadi, B.A.Litvinskii, G.Zhang Eds. History of Civilizations of Central Asia. Paris: Unesco.